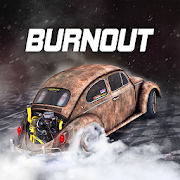 Torque Burnout is an unashamedly over the top 'driving' game which combines the best parts of every racing game! Grip the wheel, put your foot to the floor and drive like a maniac, completing donuts and drifts like a champion. Evolve your ride and push it to its limits, rally the crowd into a frenzy and then push it some more to reign supreme as the BURNOUT KING!